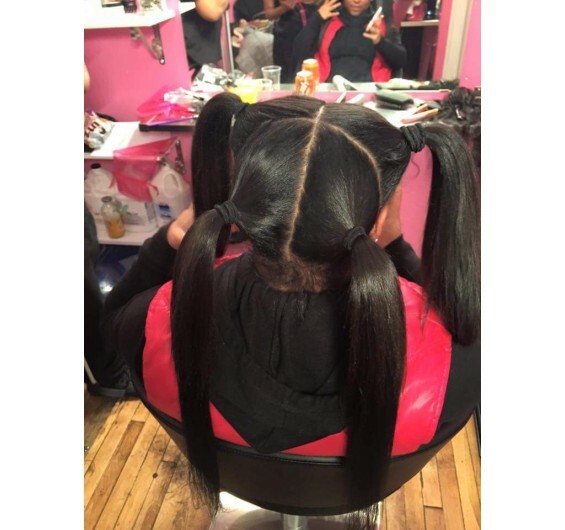 Vixen Sew in Hair Weave Near Me in Boston at Affordable Price – Book Online! Intriguing Hair selling high quality Vixen Installation wig extensions, hairstylists, celebrity hair extensions online at affordable price. Free Next Day Shipping. Shop Now! This is the most versatile sew-in allows you to part your hair in four sections. Hair can be worn half up and half down. Two french braids and a high pony tail. Clients natural hair should be shoulder length to get the most out of this hairstyle. This hairstyle requires a lot of leave-out of clients own natural hair. This hairstyle may require cutting of your hair extension bundles. Please come pre washed and free of hair products. We ask that you do not bring additional guests and contact us f your going to be late for your appointment. This is just for the hair service. You will be charged an additional $25 to install hair extensions from another company. Boston-area clients know that Intriguing Hair offers the best vixen sew in weave installation in Hyde Park. Finding a vixen sew in near me presents many options, but none like Intriguing Hair. Our warm, friendly salon and professional hairstylists are experts when it comes to vixen sew in hair weave. Vixen hair weave is one of the most versatile sew in options available. It allows you to part your hair in four sections for maximum styling versatility. This style also allows you to wear your hair in French braids, a high ponytail, or half up and half down. When it comes to hair extension installations, we take pride in customer satisfaction. Our commitment to quality shows in our work, and we have many happy clients to speak of. We look forward to welcoming you to our salon for your next vixen installation appointment. This service includes vixen installation with leave-out around the entire perimeter of your hairline. Hair must be purchased separately. Intriguing sells a line of high-quality, 100% virgin human hair, or you may choose to bring in your own hair for an additional charge of $25. Please note that your natural hair will need to be shoulder length to get the most out of this style. This hairstyle require a lot of leave-out. Vixen install also may require cutting your hair extension bundles.